Right before leaving DC for Nebraska for the Christmas holiday, I made a sweeping inventory of my fridge to toss anything that might go bad during the week I’d be gone. I threw out some bottom-of-the-tub Greek yogurt, a nearly empty jar of strawberry jam that I didn’t use up during my rediscovered PB&J phase, and a couple of fruits and vegetables. What is it about fruits and vegetables that make them the first things we grab at the grocery store and the last things we reach for when we’re at home? The night before I left, I “didn’t have anything to eat” so I went out for Chipotle, gave up on the 5-mile line, and decided on a low-key crackers and hummus dinner instead. One of the items I had tossed earlier that evening was a bag of baby carrots. Um, hello? Baby carrots and hummus? Perfect. Yet I “wasn’t up for it” and instead threw out probably $.75 worth of perfect carrots and opted for a $2.50 box of cracked pepper Triscuits instead. I’m not a penny-pincher or money hawk, but that was $3.25 I’d basically just wasted. Put it that way, that kind of cash can add up! Not to mention, I ate twice as many calories for probably not much nutritional value by opting for the Triscuits, which coincidentally were so rich that I could only eat a few with half the hummus that expired while I was away, so I lost probably another $1.25 on a half-eaten tub of expired hummus. It just makes me wonder through what other cracks my money was disappearing. The object of that story is not really “don’t waste $4.50 when you have random food laying around at home.” Or maybe it is. I think I even remember, when I was young, my mom gave the pre-vacation meal a name: smorgasbord. How fun was it to raid the kitchen and eat whatever we wanted before leaving town, just so my mom wouldn’t have to deal with it when we got back? A lot of fun, actually. The thing is this— I could have probably whipped up a halfway decent soup with the few baby carrots I had in my fridge with, say, some of the Greek yogurt I’d thrown out and a little chicken broth I’d been using for my weekly quinoa dishes. Heck, even a spoonful of strawberry jam mixed with some Greek yogurt would have been a better attempt at trying! There was just no need for me to go out and pick something up when a little effort and creativity could have gotten me a pretty decent meal at home. I’d have been able to save $4.50 and a little faith in Chipotle’s ability to handle a dinner crowd, not to mention the gas and time I wasted to get there just to come home empty-handed with a few unnecessary pre-holiday calories. I did, however, spare a seperate huge bag of baby carrots that I bought to use for…something (I forget, how funny is that?). With an expiration date of January 10, I decided to take a chance that the bag wouldn’t be able to walk out the door on its own by the time I returned. I was right– the carrots were still good a week later. On Sunday, however, almost 2 weeks since I’d purged my fridge, I knew I should probably think about using the carrots or I’d have to throw out this huge bag that cost me $2.99. I couldn’t bear the thought of doing that again at more than three times the price of the first sacrificial carrots. 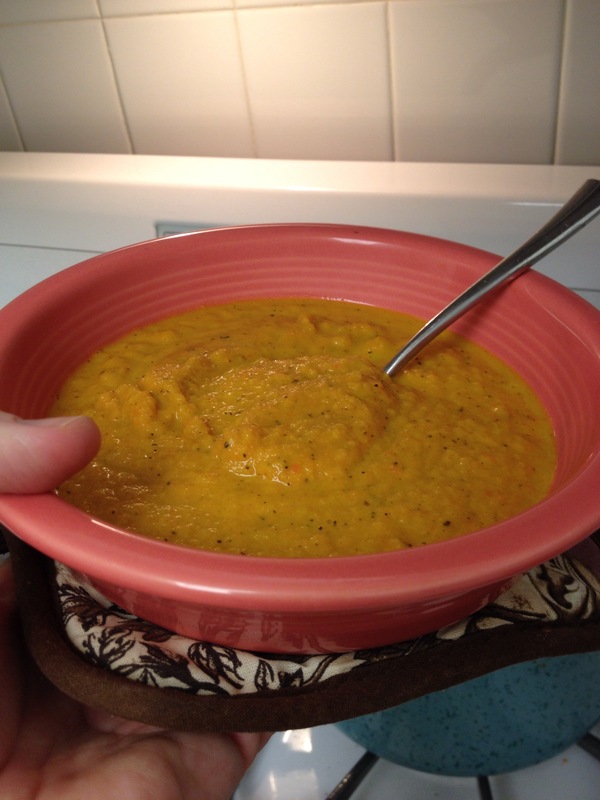 Without a real plan to follow, I concoted the idea of a creamy roasted carrot soup of some kind. While the oven was preheating to 350, I chopped up all the baby carrots and spread them out on a cookie sheet. I drizzled the carrots with a couple of tablespoons of olive oil and seasoned them with herbs de Provence, salt, and pepper. I added four cloves of garlic I was sure were on their final days, too. I let everything roast for about 30 minutes. Meanwhile, I searched my cupboards and fridge and came up with a few ingredients to add: a carton of chicken broth, a can of pumpkin that I’d intended to use during the holidays at some point, and some half and half that served as the basis for a cookie icing recipe. It was pretty much in the stars. Once the carrots finished roasting, I added them to a huge soup pot with the can of pumpkin and all 32 ounces of the chicken broth and stirred everything together over high heat. It. Smelled. UNBELIEVEABLE. I probably could have stopped there– it was a gorgeous-looking soup already– but I knew pureed soups froze better. I transferred everything to a blender, added 4 tablespoons of half and half, and pureed everything as smooth as I could get it (my blender has kind of had it with me). The result was unreal. I probably could have added a little more cream and possibly some onion for more flavor. I didn’t care though– this was a ridiculously easy and luxurious soup for literally throwing together a recipe. Right now, having just spent a lot of money to fly home, buy gifts, and take advantage of some major sales, working within the realms of my budget is my current reality. For anyone looking to do the same, this soup offers the perfect trifecta of elegance, health, and fiscal possibility. As well as ease. In fact, I’m sure if this soup appeared on a mid-winter dinner party table with some toasted crostini, no one would ever believe it costs $2.25 per serving. Less than a box of Triscuits. Now how about that? ?